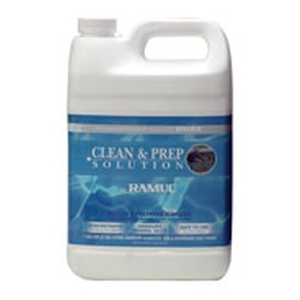 VOC CompliantPerfect for painted surfacesTurns traditional 3-steps into a 1-step processWater-rinse neutralizeOdor-free; No FumesBiodegradable, safe to use near plants & grassExcellent for filter element cleaning.Description and Use: Clean & Prep Solution is used to clean and degrease while simultaneously dissolving mineral deposits, increasing porosity for good adhesion on surfaces prior to painting.Limitation: Do not apply to concrete that has already been sealed or stained.Surface Preparation: After all surface repairs, power wash loose material off to a tight surface.For Bare Concrete, Gunite, Marcite or Plaster: Mix 1 gallon Clean & Prep Solution with 2 gallons of water. Cleans approximately 400 square feet.For Painted Surfaces or Bare Fiberglass: Mix 1 gallon Clean & Prep Solution with 5 gallons of water. Cleans approximately 600-800 square feet. Use a garden sprayer for even application of product. Be sure the heavily soiled areas (such as the waterline, steps or regular footpaths on concrete decks) are scrubbed well. Triple-rinse the surface with a strong stream of clean water while scrubbing to ensure complete removal of all material.For Pool Filter Elements: Mix 1 gallon Clean & Prep Solution to 5 gallons of hot water; soak for at least 1 hour, rinse and repeat if necessary to completely remove scum and mineral deposits.